Format: Hardcover, 1st ed., 432pp. For some thirty years before the First World War, the Church of England maintained a mission of help to the Assyrian Church of the East (popularly known as the Nestorian church) in its then homeland, a corner of eastern Turkey and north-western Persia. The Mission had a controversial history. At home, not everyone could appreciate the rationale of a mission which was to aid an obscure and heretical body and which strictly forbade any conversions from this body to the Anglican church. In the field, the missionaries had to do battle with xenophobic governments, with rival American and French missions, and with the Assyrians themselves, whose confidence proved difficult to gain. In some respects the Mission was unsuccessful, but it had notable accomplishments, especially in scholarship and in ecumenical diplomacy. 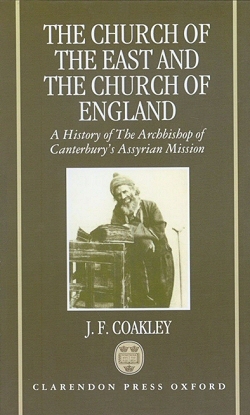 Besides being the history of a Victorian missionary society, the present study deals in some detail with the history of the Assyrians in the nineteenth and twentieth centuries - both as the survival of an ancient church with hierarchy, liturgy, and theological formulas, and as an ethnic minority in the Middle East. Illustrations and maps enhance the value of the book as a source for the history of the time and place. This is the first study of the relations between the church of England and the Church of the East, and is based on largely unpublished documents in English and Syriac. The Church of the East and the Church of England - Amazon's online bookstore.